Lake Effect's Joy Powers looks into high-speed rails in Wisconsin. “I don’t just want jobs that are created short-term based upon a government subsidy, I want jobs that are long-term and sustainable. And the most sustainable jobs — 75 percent to 80 percent — are likely to come from small businesses, not from employers getting government subsidies,” Walker said while speaking to a group of reporters in 2010. He was talking about a specific plan that would have brought $810 million in federal subsidies to Wisconsin for high-speed rails. "There was a very carefully laid out plan — a Midwest Regional Rail Initiative — that essentially saw Chicago as being the center in a wheel, so a spoke approach, where there would be higher speed rail connections between Chicago and Milwaukee ... connecting Milwaukee and Madison and going then all the way to Minneapolis," says Rob Henken. Rob Henken, president of the Wisconsin Policy Forum, first came to the state in the 1990s to work for an organization called Alliance for Future Transit. He says the origins of this specific plan for a higher speed rail system go back to 2004. 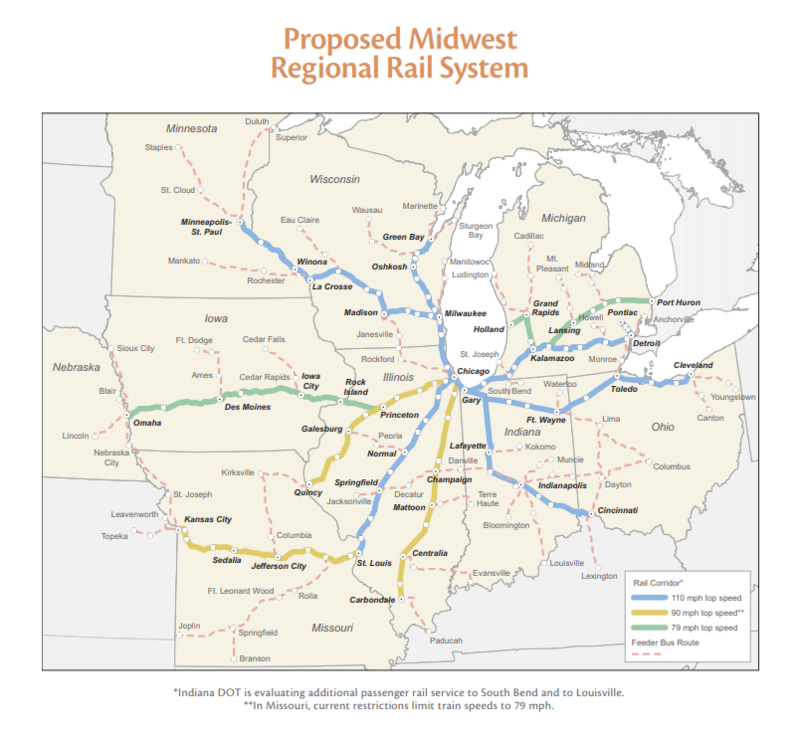 A map from the Midwest Regional Rail System Executive Report from 2004. "There was a very carefully laid-out plan — a Midwest Regional Rail Initiative — that essentially saw Chicago as being the center in a wheel," he explains, "so a spoke approach, where there would be higher speed rail connections between Chicago and Milwaukee, heading then west to Madison. So, connecting Milwaukee and Madison and going then all the way to Minneapolis. Higher speed rail between Chicago and St. Louis, higher speed rail to Detroit and throughout the Midwest." Henken continues, "So once upon a time, you had nine Midwestern states that were all on board — no pun intended — to actually try to lobby together for the federal government to allocate federal resources to do this whole Midwest Rail Initiative." And they succeeded. At the time, Wisconsin Gov. Jim Doyle was able to secure $810 million in federal subsidies, earmarked by the Obama administration to help create parts of this system — specifically, a line connecting Milwaukee and Madison. But there was a problem. "When Gov. Scott Walker was a candidate, he made one of his platform planks stopping that project, so when he was elected, actually, Gov. Doyle stopped the project the day after the election in 2010," says Kevin Muhs, the deputy director of the Southeastern Wisconsin Regional Planning Commission. EXTENDED CONVERSATION: Kevin Muhs, the deputy director of the Southeastern Wisconsin Regional Planning Commission, speaking with Joy Powers. During his campaign, Walker made it clear he thought the project would be a waste of money. There were other transit issues he thought were more pressing, like fixing Wisconsin’s “crumbling roads and bridges,” as he put it in 2010. The operating bill for the train was projected to be $7.5 million a year, which he felt was too high a burden. For perspective, Wisconsin’s DOT budget for 2015 to 2017 allocates more than $3 billion for roads. According to Kevin Muhs, there’s a common misconception about transit’s ability to make money. "No mode of transportation pays for itself, but for some reason we have a perception that the automobile does, whereas transit doesn’t. Which is inaccurate but that certainly is the perception," he says. "No mode of transportation pays for itself, but for some reason we have a perception that the automobile does, whereas transit doesn't," says Kevin Muhs. At one time, mass-transit was profitable, but Henken says that’s no longer the case. "Fifty, sixty years ago, you had private companies running rail systems and able to make money. Some argue that because we have so heavily subsidized highway building and automobile usage, that meant the private sector couldn’t make money running rail systems or any type of transit system," says Henken. EXTENDED CONVERSATION: Transit expert Rob Henken speaking with Joy Powers. The money earmarked for a higher-speed rail in Wisconsin was given away. Other states in the Midwest accepted the money and used it to update their rails and make them more efficient. "You're providing the connectivity that helps the economy move and makes it easier for people, in this case, to move around and access jobs more easily, shop more easily, access education more easily, which is good for the economy," says Kevin Muhs. It’s unclear what a higher speed rail could mean for Milwaukee, but Muhs says it really comes down to connectivity. "It’s like any other transportation investment. You’re providing the connectivity that helps the economy move and makes it easier for people, in this case, to move around and access jobs more easily, shop more easily, access education more easily, which is good for the economy," he says. The question now: what will it take to get a higher-speed rail system in Wisconsin? The answer, say analysts: a confluence of political will, funding and a plan. We already have the last part. Wisconsin's Department of Transportation has a passenger rail plan called Connections 2030, which was first developed in 2009 before Walker took office. 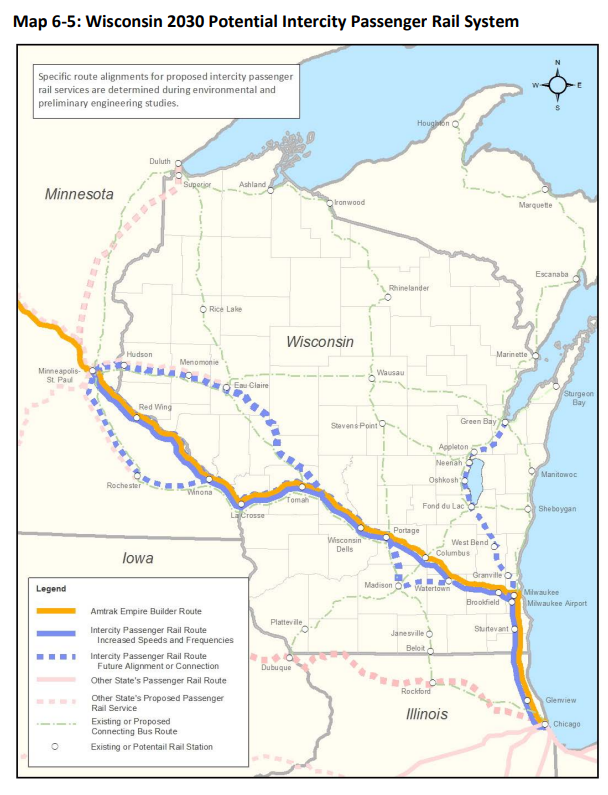 Muhs explains, "That passenger rail plan has basically two dominant corridors: from Chicago to the Twin Cities, connecting Milwaukee and Madison and communities in between; and then from Chicago to Green Bay, including connecting to Milwaukee and the Fox Cities. They’ve got specific plans, that would [have] 110 mph service, so many trips per day, it’s all spelled out in the plan. The political piece of it is a real challenge to figure out what the future holds." A map from the Connections 2030 plan. Making these kinds of plans a reality takes a lot of politicians working across municipalities, state lines and political divides, coming together to reach consensus. Our current political climate may make that seem unlikely, but Rob Henken says it could happen and the federal government may once again want to earmark funds for the initiative. "Since the Trump Administration came in there’s been talk about infrastructure maybe being the issue where the Republicans and the Democrats could agree," he says. "And now in the wake of the elections there’s talk again that infrastructure may be one of the top agenda items in Washington and if that’s the case, might it include a high-speed rail component? Hard to say, I guess there’s a slight possibility," he says. But if it isn’t part of the federal plan, then Wisconsin, Illinois and Minnesota would have to come together to raise the funds, which Henken says could be prohibitively expensive. The Bubbler Talk question-asker wants to know two things: why there isn’t a high-speed rail in Wisconsin, and whether or not it was something that would ever come to the state. And the short answer to both: political will. We don’t have a high-speed rail in Wisconsin because politicians decided it wasn’t important. We could have one if politicians decide it is important. Lake Effect's Dan Harmon talks with Matt van Hattem. Scott Walker rose to the governor’s seat in a campaign that pledged – among other things – to kill plans for high-speed rail in Wisconsin. Why Do Wisconsinites Call That A Bubbler, Anyway? Katie Gnau recently moved to Shorewood from Chicago. And when her daughter came home from school one day, Katie noticed she had picked up a new word for a familiar item. So, she asked WUWM's Bubbler Talk: Why does everyone around here call that a Bubbler, anyway?